Distribution of air in the passenger compartment. De-icing/demisting of the rear screen and, depending on the vehicle, the door mirrors. 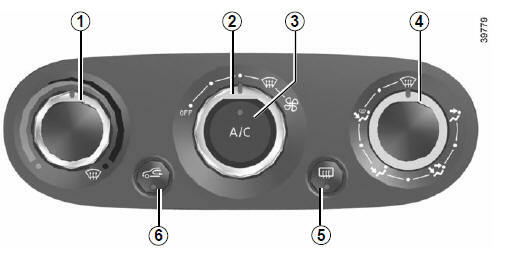 The air conditioning is switched on (indicator light on) or off (indicator light off) using button 3. Activation is not possible if control 2 is set to OFF. There are five air distribution options. Turn control 4 to choose the distribution option. windscreen and the front side window demisting vents. between all the air vents, the front side window demisting vents, the windscreen demisting vents and the footwells. the dashboard air vents, the front footwells and, depending on the vehicle, the second row footwells. lowering the passenger compartment temperature as quickly as possible. Move control 2. The further the control is positioned to the right, the greater the amount of air blown into the passenger compartment. If you want to shut off the flow of air, set control 2 to OFF. The system is deactivated: the ventilation speed is zero (vehicle stationary). You can, however, still feel a slight flow of air when the vehicle is moving. mode to avoid any risk of condensation forming on the windscreen and triggers the air conditioning function. The integrated light in button 3 does not come on. With the engine running, press button 5. The operating tell-tale comes on. This function permits rapid demisting/ de-icing of the rear screen and de-icing of the door mirrors (on equipped vehicles). To exit this function, press button 5 again.